Troubleshooting Invoice Stuck in "Pending Accounting"
How to resolve stuck invoices for Intacct and Quickbooks users. Invoices that have a status of "pending accounting" are waiting on your external accounting software to process them. No action in or by ServiceTrade is required. It is normal for invoices to be in this state for a short time (several minutes to an hour), depending on a number of factors. Below, we cover actions that you may take if you notice an invoice stuck in this status for an unusual length of time. There are different steps depending on which accounting system you use. 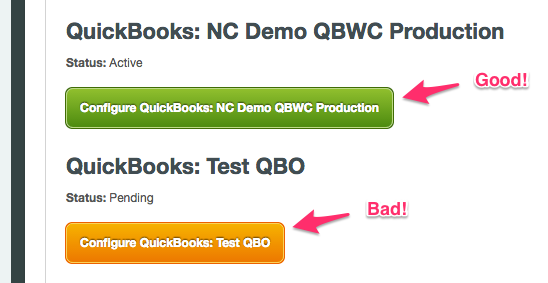 Check the Quickbooks Web Connector (QBWC), which should either be installed on your QB server, or where your company files reside if you don't have a dedicated server. If you don't know where this is installed, STOP and go find the person that does. 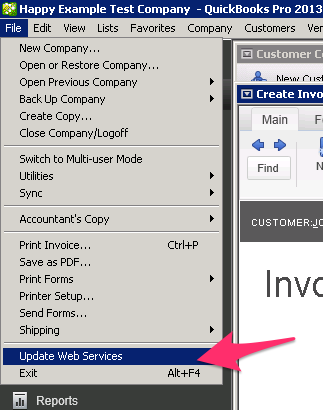 If it is not running, open Quickbooks, then click File -> Update Web Services to reopen the Web Connector. 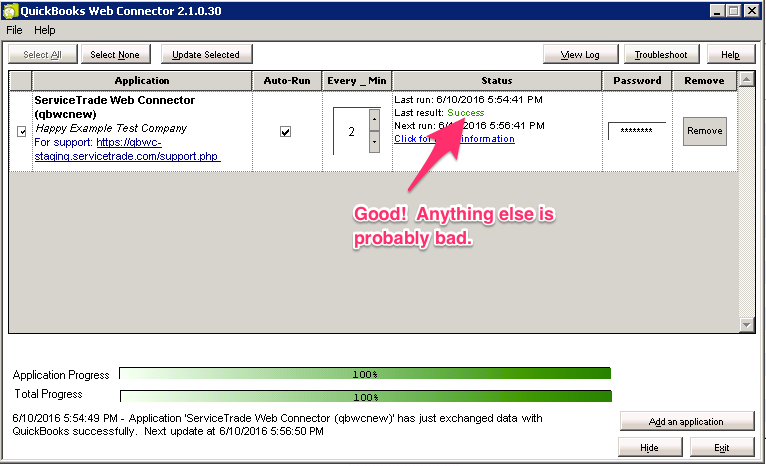 Know the interval that Quickbooks Web Connector refreshes. 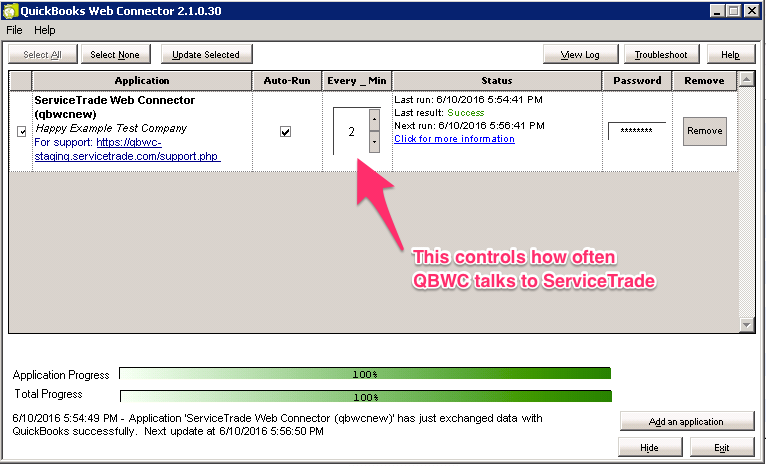 ServiceTrade may simply be waiting for the next time your Quickbooks Web Connector is processing requests. This may be as little as every 2 minutes or could be set to once per day. If this is not known, have the administrator of the PC/Server that runs Quickbooks Web Connector answer this, and share with the team. Check the status of the last run. Anything other than "Success" is probably bad, so take a screenshot or write down exactly what the message is so you can provide that information to ServiceTrade support in step 6 below. An admin user of ServiceTrade should check the Quickbooks Integrations settings (https://app.servicetrade.com/account). Make sure there is only one integration per company file, and that integration has a green button. An orange button means further configuration settings are required before any invoice goes over. Click the orange button and complete configuration. If none of the above solve the issue, send us a message with the invoice number, status error message, and any other relevant information and we will take a look. Remember, we can't easily help with "it's broken" but if you've followed the steps above and provide us actionable information, we will be much better positioned to quickly help you. Please provide contact info for the admin of the PC/Server that is designated to run Quickbooks Web Connector.